The aim of the present work was to evaluate molar ratio iron:zinc and the levels of folic acid in biscuit and snacks commercialized in Brazil, prepared with folic acid and iron fortified flours. These nutrients are important for human nutrition; however, iron can have a negative effect on zinc absorption. Molar ratio iron:zinc can indicate if there will be any problems for absorption of these nutrients. The folic acid content varied from 58 to 433 μg/100g and iron and zinc levels varied from 2.9 to 9.4 mg/100g and from 0.2 to 1.3 mg/100g, respectively, for 75 analyzed samples. The average iron contents observed in the products and molar ratio iron:zinc (in average 8:1 for biscuits and 12.8:1 for snacks) could result in problems with the zinc absorption. Moreover, principal component analyses (PCA) indicated low uniformity in the distribution of minerals and vitamin in the majority of the samples, mainly among brands. The results indicated that for the majority of the samples tested folic acid and iron content was higher than expected for flours and could be useful to governmental authorities in their evaluation program of flour fortification. Key words: Fortified flour, minerals, vitamin. O objetivo do presente trabalho foi avaliar razão molar ferro: zinco e os níveis de ácido fólico em biscoitos e snacks, comercializados no Brasil, preparados com farinhas fortificadas com ácido fólico e ferro. Esses nutrientes são importantes para nutrição humana, porém, o ferro pode ter efeito negativo na absorção do zinco. A razão molar ferro:zinco pode indicar se haverá problemas para absorção desses nutrientes. O teor de ácido fólico variou de 58 a 433 μg/100g e os níveis de ferro e zinco oscilaram de 2.9 a 9.4 mg/100g e de 0.2 a 1.3 mg/100g, respectivamente, para 75 amostras analisadas. O valor médio observado para o teor de ferro nos produtos e a razão molar ferro:zinco (em média 8:1 para biscoitos e 12,8:1 para snacks) podem resultar em problemas na absorção do zinco. Além disso, a análise por componentes principais (PCA) indicou baixa uniformidade na distribuição dos minerais e da vitamina na maioria das amostras, principalmente entre marcas. Os resultados mostraram que para muitas amostras o teor de ácido fólico e de ferro estava acima do esperado para as farinhas e podem ser utilizados pelas autoridades governamentais para a avaliação do programa de fortificação de farinhas. Palavras chave: Farinhas fortificadas, minerais, vitamina. Public health authorities in many countries have taken steps to improve the periconceptional intake of folic acid in women planning pregnancy. In the last decade, a great deal of experimental data, epidemiological evidence and clinical trials indicated that dietary folate intake can modulate and inhibit colon, lung, cervix, esophagus, stomach, brain, pancreas, breast, bone marrow and neuroblastoma carcinogenesis. These studies suggest an inverse association between folate intake and the risk of malignancies. It has been suggested that dietary folate supplementation might protect against the initiation of carcinogenesis. Consequently, by contrast, folate deficiency would predispose to cancer and, in advanced tumorigenesis, folate supplementation might actually potentiate the growth and progression of lesions (1-5). Iron deficiency is the most common nutritional disorder in the world, and it is estimated that as many as 3.5 billion people could be affected, thus being an important public health problem in both developed and developing countries (6). However, cell DNA damage under pro-oxidant conditions, has been shown to be mediated by iron, since iron is an important element in the establishment of a pro-oxidant status in the cell (7). In epidemiologic studies reviewing diet patterns to assess past exposure to dietary iron, one report (8) found no association, whereas two other studies reported possibly increased risks of Parkinson’s disease with increasing levels of dietary iron (9,10). Zinc has catalytic, structural and regulatory functions and is a component of many enzymes. Skin lesions, anorexia, growth retardation, hypogonadism and the immune suppression function are caused by zinc deficiency. The cause of an inadequate zinc status may be associated with the dietary intake and inhibitors of zinc absorption (11-13). Many studies have shown that high concentrations of iron could have a negative effect on zinc absorption in human adults, when zinc and iron are both present in a solution. An adequate Fe:Zn molar ratio is 4:1 (11,14). In 2002, Brazil issued a regulation, effective in 2004, requiring corn and wheat flours to be fortified by the addition of folic acid (150 μg 100g-1 ± 20 %) and iron (4.2 mg 100g-1 ± 20 %) (15), but the concentration of these nutrients in foods containing fortified flours as an ingredient is unknown. Brazilian flours are not fortified with zinc, but to know zinc levels is important for the establishment of Fe:Zn molar ratio in these type of food. According to IBGE (Brazilian Institute of Geography and Statistics), the average consumption of biscuit by the Brazilian population is 4.8 Kg/person/year (16). According ANIB (Nacional Association of Biscuits Industry) the average consumption of snacks prepared from fortified corn flour was approximately 0.2 Kg/person/year (17). The Recommended Dietary Intakes (RDI) of folic acid, iron and zinc are 240μg, 14 mg and 7 mg, respectively, for adults. In pregnancy the RDIs for the same nutrients are 355 μg, 27 mg and 11 mg (18). Biscuits and snacks are popular food eaten by both children and adults; however, they are typically high in the components that make them “unhealthy”. Thus, the aim of this work was to evaluate the molar ratio iron: zinc and folic acid levels in biscuits and snacks produced with wheat and corn fortified flour, in order to contribute to an evaluation of the impact of the mandatory fortification program in Brazil. The samples evaluated showed the following characteristics: three different brands of milk (MC 1 – MC 3), cream cracker (CB 1 – CB 3) and cornstarch (CC 1– CC 3) biscuits, all in five (A-E) batches respectively and 30 samples of snacks (SN 1 – SN 30), in ten different types, in 3 batches (A-C), chosen at random. The batches were purchased in local markets in the city of Campinas, São Paulo State, Brazil, and were differentiated according to their expiry dates. The product labels contained information about the ingredients: wheat flour fortified with folic acid and iron. The samples were homogenized, submitted to a sampling procedure, crushed and sieved (equipment with a 28 mesh particle size). The iron, zinc and folic acid determinations were then performed in triplicate. Folic acid was obtained from Sigma USA (F-7876). Chromatographic grade acetonitrile was acquired from J. T. Backer, USA. Analytical grade acetic acid, potassium hydroxide, trichloroacetic acid, anhydrous dibasic sodium phosphate (Na2HPO4) and anhydrous monobasic potassium phosphate (KH2PO4) were obtained from Synth, Brazil. The water used in the preparation of the solutions and mobile phase was distilled and deionized (18 MΩ.cm resistivity). The mobile phases and samples after extraction were filtered through Millipore filters (HAWP and FHLP Millipore, Brazil), with 0.45μm diameter pores. Nitric acid and hydrogen peroxide were acquired from Merck, Germany. Standard iron and zinc solutions were prepared by appropriate dilution of 1000 mg L (AccuStandard, USA) as stock solutions. An Agilent Technologies (USA) series 1100 Liquid Chromatograph equipped with a binary pump and diode array detector was used for the folic acid determination. The Chemstation data acquisition system was used to collect the chromatographic data and to evaluate the peak areas. Folic acid was separated using a Hypersil ODS 5μm, 125X4.0 mm i.d. column (Agilent Technologies), protected by a Hypersil ODS 5μm, 4X4 mm i.d. guard column (Agilent Technologies). A Perkin-Elmer Analyst 300 Atomic Absorption Spectrometer (USA) equipped with a deuterium lamp background corrector was used for the iron and zinc determinations. The liquid sample was aspirated with the help of a pneumatic nebulizer and mixed with an oxidizing air/acetylene (10 and 3 L min flow rate, respectively) flame. The metals were measured in their fundamental states using a hollow cathode lamp for iron (248.3 nm) and zinc (213.9 nm). The other operational parameters (current and slit) were those recommended by the manufacturer. One gram (1.00 g) of each sample of the biscuits and snacks homogenates was taken after sampling and milling the entire material. The vitamin was analyzed according to Boen et al. (19), with modifications in gradient elution. Folic acid was separated using gradient elution, starting with a 100 % acetic acid solution (2 % v/v) pH 2.8, and then adding acetonitrile to reach a mixture containing 76 % acetic acid plus 24 % acetonitrile in 12 minutes for biscuits and 28 minutes for snacks samples. The flow rate was 1.0 mL/min. Identification of the vitamin was provided by comparison of the retention times obtained with a standard analyzed under the same conditions, and also by spiking and comparison of the absorption spectra obtained by DAD. Peak purity was determined using the plotter system available in the Chemstation software. Quantification was performed using an external standard (calibration solutions from 0.045 to 1.5 μg/100g), the analytical curve presenting good linearity in the preestablished concentration bands. After total homogenization of the entire material aliquots of biscuits and snacks, they were taken and mineralized in a digestion block according to Boen and Lima-Pallone (20). Standard iron and zinc solutions containing from 0.5 to 6 mg/L and from 0.1 to 1.0 mg/L, respectively, were prepared using the same 0.01 mol/L HNO3 solution. Both the standard solutions and the samples were analyzed using the atomic absorption spectrometer described in the Equipment section. Principal Component Analysis (PCA) was running in Matlab 6.1 Software (Mathworks). The data were represented as a matrix of 15 rows (samples) and 3 columns for biscuits and 30 rows (samples) and 3 columns for snacks, corresponding by 3 variables (iron, zinc and folic acid contents). Due to the different units, the data matrix was autoscaled. Numbers 1 to 5; 6 to 10; 11 to 15 represents MC 1, CB 1, CC 1, batches A to E; MC 2, CB 2, CC 2, batches A to E; MC 3, CB 3 and CC 3, batches A to E, respectively (Figures 2, 3 and 4). In Figure 4, SN 1 to SN 30 was represented with numbers 1 to 30, respectively. For variance analyses Origin 6.1 (OriginLab Corporation, Northampton MA, 01060. USA) program was used. 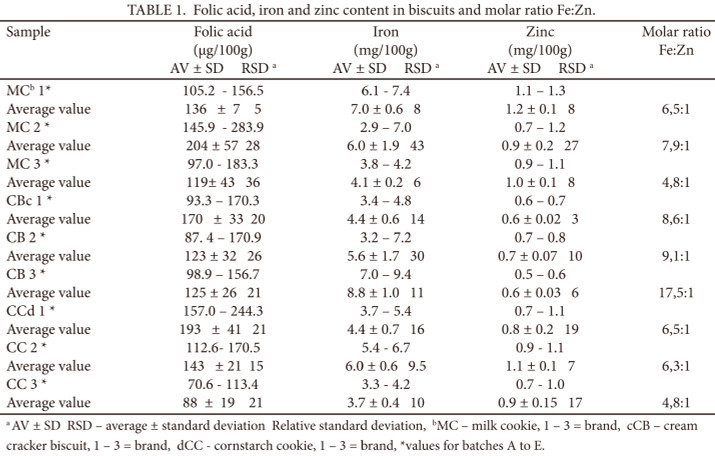 Table 1 summarizes the results obtained in the determinations of the folic acid, iron and zinc contents in the samples of biscuits. For milk biscuits the vitamin, iron and zinc levels ranged from 97 to 284 μg/100g (average of 153 μg/100g), 2.9 to 7.4 mg/100g (average of 5.2 mg/100g) and 0.7 to 1.3 mg/100g (average of 1.0 mg/100g), respectively. In cream cracker biscuits the folic acid content varied from 87 to 171 μg/100g (average of 126 μg/100g), and the iron and zinc levels from 3.2 to 9.4 mg/100g (average of 6.2 mg/100g) and 0.5 to 0.8 mg/100g (average of 0.6 mg/100g), respectively. In cornstarch biscuits the vitamin content varied from 71 to 244 μg/100g (average of 142 μg/100g), and the iron and inc levels from 3.7 to 6.7 mg/100g (average of 4.7 mg/100g) and 0.7 to 1.1 mg/100g (average of 0.9 mg/100g), respectively. 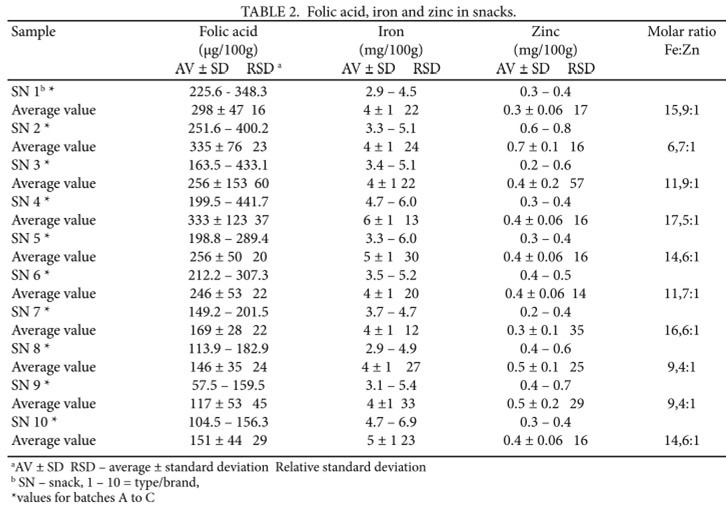 Table 2 shows the results obtained in the determinations of folic acid, iron and zinc in snacks. The folic acid concentration ranged from 57.5 to 433.1 μg/100g (average of 204 μg/100g), and the variance analyses indicated differences amongst the values (95% of confidence). The iron and zinc levels ranged from 2.9 to 6.9 mg/100g (average of 4.4 mg/ 100g) and from 0.2 to 0.8 mg/100g (average of 0.4 mg/100g), respectively, and for iron the variance analyses indicated differences amongst the values (95 % of confidence). In Brazil, the folic acid content in wheat and corn flours varied from 73 to 558 μg/ 100g, and in the same samples, the iron concentration ranged from 4.6 to 7.4 mg/100g, on average, in the eight different brands evaluated by Boen et al. (19) and Soeiro et al. (21). In order to extract maximum information from these data (folic acid, iron and zinc composition in biscuits and snacks) the Principal Component Analyses (PCA) test was applied. Figures 1, 2, 3 and 4 present scores and loadings plot. 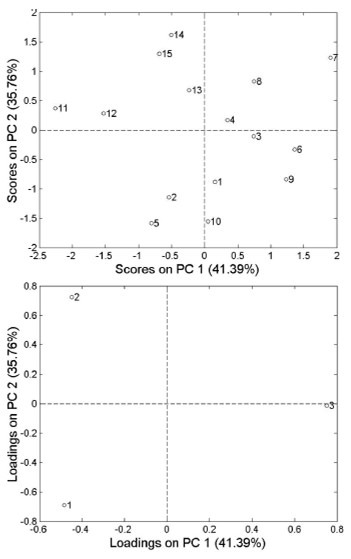 PCA was calculated and two principal components were necessary to explain 90, 77and 83 % of the total variance for MC (1-3), CB (1-3), CC (1-3) and SN (1-30), respectively. In Figure 1 it was possible to observe that samples MC 1 (named 1 to 5) were characterized with higher folic acid and were clustered. The samples MC 3 (11 to 15) were grouped and contained more zinc. Samples MC 2 (6 to 10) were not clustered according to folic acid, iron and zinc composition. 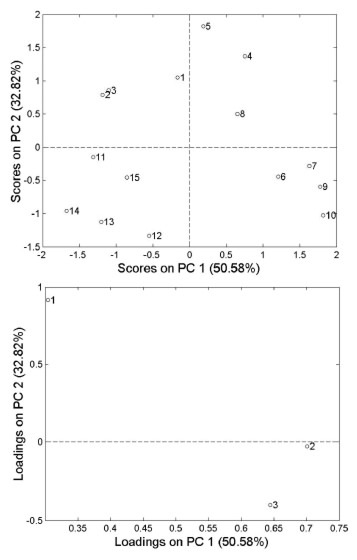 Figure 1 – A – Scores plot MC samples by PCA : MC1 A-E (1 to 5), MC2 A-E (6 to 10) and MC3 A-E (11 to 15) ; B – A – Loads plot MC samples by PCA: 1 – folic acid, 2 – iron and 3 – zinc. For samples of cream cracker biscuits, CB 1 and CB 2, it was not observed grouping according to each brand. Only CB 3 (11 to 15, in Figure 2) presented cluster characterized by high iron content. 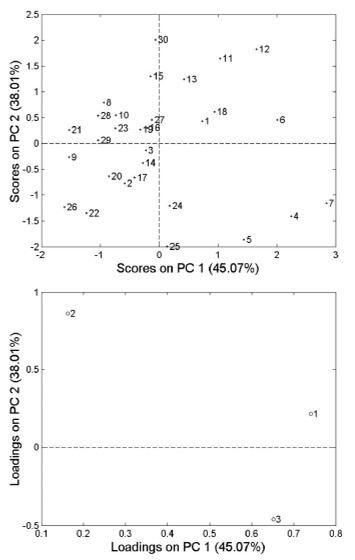 Figure 2 – A – Scores plot CB samples by PCA : CB1 A-E (1 to 5), CB2 A-E (6 to 10) and CB3 A-E (11 to 15) ; B – A – Loads plot CB samples by PCA: 1 – folic acid, 2 – iron and 3 – zinc. Samples of cornstarch cookies were characterized by grouping related to brands. Samples CC 1 (1 to 5 in Figure 3) contained more folic acid levels. On the other hand, CC 2 (6 to 10), presented more iron and zinc and CC 3 (11 to 25) were clustered, but the variables folic acid, iron and zinc were not responsible for this action. 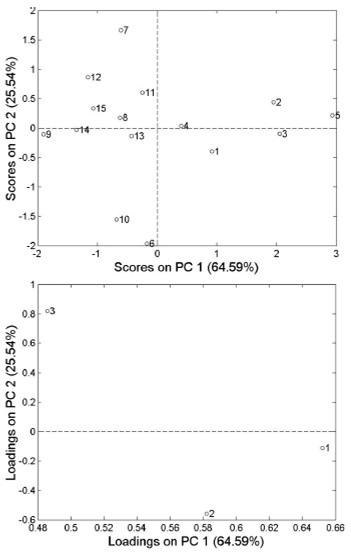 Figure 3 – A – Scores plot CC samples by PCA : CC1 A-E (1 to 5), CC2 A-E (6 to 10) and CC3 A-E (11 to 15) ; B – A – Loads plot MC samples by PCA: 1 – folic acid, 2 – iron and 3 – zinc. Figure 4 –A – Scores plot SN samples by PCA : SN1-30 A-C (1 to 30) different samples ; B – A – Loads plot SN samples by PCA: 1 – folic acid, 2 – iron and 3 – zinc. Among biscuits in 13% of the samples the folic acid concentration exceeded the regulatory value for fortified flours by approximately a twofold value. In average 38 % of the products tested contained levels below the value added and 49% were in accordance with the values cited in the Brazilian legislation for fortified flours. For iron 49 % of samples were in accordance, 42% exceeded the regulatory value for fortified flours and 9 % contained levels below the amount added to flours. In 63% of the samples of snacks the folic acid concentration exceeded the regulatory value for fortified flours by approximately a twofold value, as well as 10 % of the products tested contained levels below the value added and 27% were in accordance with the expected values for enriched flours. In 33% of the snacks the iron content exceeded the regulatory value, 23 % of the products tested contained levels below the value added and 44 % were in accordance with the values for iron content in the Brazilian legislation for fortified flours. The variance analysis (95% of confidence) indicated significant differences for the values obtained for folic acid and iron in the samples. Other researchers have found similar data for other types of food. Thomson (22) evaluated enriched cereal foods and verified that the iron concentration was in accordance or exceeded the label claim, and the folate content was below the label claim in 24 % of the products tested and exceeded it in 34%. Rader et al. (23) reported a variation from 33 to 229 μg/100g for folic acid in samples of flour commercialized in the USA. Sadighi et al. (24) evaluated flours fortified with iron in Iran and found a mean value of 5.28 mg/100g. The percentages of flour samples with high, acceptable, good and low iron levels were 0%, 14%, 74.4% and 11.6%, respectively. Boen and Lima-Pallone (20) verified that for macaroni, pizza and bread prepared with fortified flour, the levels of folic acid and iron varied from 14.8 to 481.4 μg/100g, 1.6 to 12.4 mg/100g, respectively. The observation of PCA test indicated low uniformity in the distribution of minerals and vitamin in the majority of samples, mainly among brands. On the other hand, changes in values are not sufficient for grouping biscuits and snacks according each brand, except for samples MC 1, MC 3, CB 3, CC 1 and CC2, indicating no standard behavior when iron, zinc and folic acid were considered as variables. The nutrients evaluated presented random in the majority of the samples. PCA also indicated that for samples characterized by high folic acid or iron, most of them contained excess of the nutrient. The molar ratio iron: zinc (Fe:Zn) was, in average, 6.4:1.0, 11.7:1.0, 5.9:1.0 and 12.8:1 for milk, cream cracker, cornstarch biscuits and snacks, respectively. For all samples the Fe:Zn molar ratio indicated that zinc absorption could be compromised. The results showed there was huge variability in the content of folic acid and iron in different samples of the same type of product (biscuits and snacks) prepared with fortified flours. These data could be related to the conditions required for folic acid stability, problems with the premix composition and the difficulty in adding the premix containing folic acid and iron to the fortified flours. Moreover, the average values for iron observed in the products could lead to problems with zinc absorption, contributing to a zinc deficiency in some groups of the population, and it is important to point out that iron can induce oxidative stress in cells.This study could be a useful tool for the governmental authorities in their food fortification evaluation programs. The authors are grateful to the Fundação de Amparo à Pesquisa do Estado de São Paulo (FAPESP) (process: 04/02664-4, 04/14413-6, 09/50730-0). Wright AJA, Finglas PM, Southon S. Proposed mandatory fortification of the UK diet with folic acid: have potential risks been underestimated? Trends Food Sci. Tech. 2001; 12: 313-321. Kim YI. Role of folate in colon cancer development and progression. J. Nutr. 2003; 133: 3731S-3739S. Bollheimer LC, Buettner R, Kullmann A, Kullmann F. Folate and its preventive potential in colorectal carcinogenesis. How strong is the biological and epidemiological evidence? Crit. Rev. Oncol/Hematol. 2005; 55: 13-36. Canistro D, Pozzetti A, Sapone A, Broccoli M, Bonamassa B, Longo V, Lubrano V, Barillari J, Biagi GL, Paolini M. Perturbation of rat hepatic metabolising enzymes by folic acid supplementation. Mut. Res. 2008; 637: 16-22. Omar RM, Ismael HM, Adb-Lateef BM, Yousef MI, Gomaa NF, Sheta M. Effect of processing on folic acid fortified Baladi bread and its possible effect on the prevention of colon cancer. Food Chem.Toxicol. 2009; 47: 1626-1635. ACC/SCN. Administrative Committee on Coordination/Subcommittee on Nutrition. (United Nation) 2000; Fourth Report on the World Nutrition Situation. United Nations. Meneghini R. Iron homeostasis, oxidative stress, and DNA damage. Free Rad. Biol. Med. 1997; 23(5): 783–792. Anderson C, Checkoway H, Franklin GM, Beresford S, Smith-Weller T, Swanson PD. Dietary factors in Prakinson’s disease: the role of food groups and specific foods. Movem. Disord. 1999; 14: 21-27. Johnson CC, Gorell JM, Rybicki ba, Sanders K, Peterson EL. Adult nutrient intake as a risk factor for Parkinson’s disease. Int. J. Epidem. 1999; 28: 1102-1119. Powers KM, Smith-Weller T, Franklin GM, Longstreth JR WT, Sawason PD, Checkoway H. Parkinson’s disease risks associated with ietary iron, manganese, and other nutrient intakes. Neurol. 2003; 60:1761-1766. Lonnerdal B. Dietary factors influencing zinc absorption. J Nutr. 2000; 130:1378S-1383S. McCall KA, Chih-Chin H., Fierke CA. Function and mechanism of zinc metalloenzymes. J Nutr. 2000; 130:1437S-1446S. Salgueiro MJ, Zubillaga M, Lysionek A, Sarabia MI, Caro R, Paoli TD, Hager A, Weill R. Boccio J. Zinc as an essential micronutrient: a review. Nutr. Res. 2000; 20(5): 737-55. Davidsson L, Almgren A, Sandstrom BRF. Zinc absorption in adult humans: the effect of iron fortification. British J. Nutr. 1995; 14: 411-425. ANVISA. National Agency of Sanitary Vigilance. 2002;. RDC 344. Retrieved nov/ 2012. www.anvisa.gov.br/e-legis. IBGE. Brazilian Institute of Geography and Statistic – POF 2008-2009; Retrieved nov/ 2012. http://www.ibge.gov.br/home/estatistica/populacao/condicaodevida/pof/2002aquisicao/defaulttab.shtml. ANVISA. National Agency of Sanitary Vigilance. 2005; RDC 269. Retrieved nov/ 2012. www.anvisa.gov.br/e-legis. Boen TR, Soeiro BT, Pereira-Filho ER, Lima-Pallone JA Folic acid and iron evaluation in Brazilian enriched corn and wheat flours. J. Braz. Chem. Soc. 2008; 19: 53-59. Boen TR, Lima-Pallone JA Folic acid, iron, and zinc contents in chosen food products prepared with fortified flours. Cereal Chem. 2009; 86:(6), 695-700. Soeiro BT, Boen TR, Wagner R, Lima-Pallone JA Physico-chemical quality and homogeneity of folic acid and iron in enriched flour using principal component analysis. Intern. J. Food Sci. Nutr. 2009; 60: 167-179. Thomson B. ESR Report on Fortification overages of the food supply. Folate and iron. 2005;38p. Rader JI, Weaver CM, Angyal G. Total folate in enriched cereal-grain products in the United States following fortification. Food Chem. 2000; 70: 275-289. Sadighi J, Sheikholeslam R, Mohammad K, Pouraram H, Abdollah, Z, Samadpour K, Kolahdooz F, Naghavi M. Flour fortification with iron: a mid-term evaluation. Pub. Health, 2008; 122: 313-321.